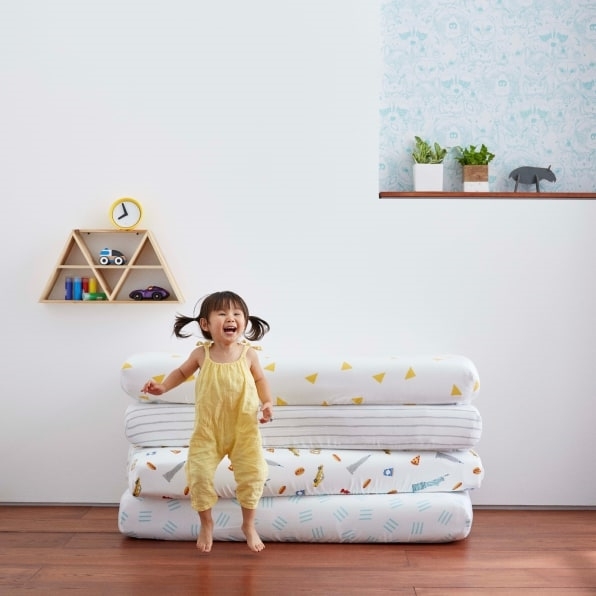 Fast-growing bedsheet startup Brooklinen has just launched a line of sheets for kids called Brooklittles. In keeping with Brooklinen’s sleek, urban aesthetic, the brand has ditched the cutesy pastel bunnies and elephants you find in traditional baby bedding. Instead, the first collection features gender-neutral prints, like little yellow triangles and blue matchsticks. One print is an ode to New York, with little taxi cabs, pizza slices, the Empire State Building, and pretzels sprinkled throughout. Brooklinen has been growing quickly since it launched four years ago. Last year, the brand says it generated $50 million in revenue, and it also landed its first round of funding, a $10 million Series A. Today, Brooklinen opens its first-ever brick-and-mortar pop-up in Soho. These new baby sheets are part of growing trend: Hip, direct-to-consumer startups creating kid-sized versions of their products–with cute names to match. Allbirds came up with mini versions of their sneakers called Smallbirds. Warby Parker has kids’ versions of many of their adult designs, so you and junior can look identical. East Fork Pottery has a toddler version of its entire ceramic dining set. Now, you and your baby can have coordinated bedding.